Kris Meeke boosted his hopes of holding on to his Citroen drive for 2016 after finishing third at the Australian Rally World Championship event. In second spot overnight, Dungannon man Meeke lost time in Sunday's concluding five stages but he did enough to secure his sixth podium spot in a WRC event. 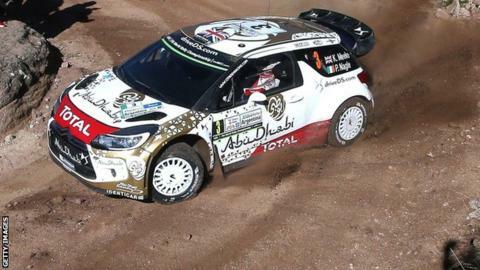 Meeke, 36, finished 32.6 seconds behind Sebastien Ogier who clinched his third straight world title by taking the win. Ogier was 12.3 seconds ahead of runner-up Jari-Matt Latvala. Despite securing his first World Rally win in Argentina in April, Meeke has been under pressure to retain his Citroen drive after a series of recent crashes in the series. Prior to last month's German Rally, Citroen boss Yves Matton has said that Meeke's seat for 2016 was under threat after the Northern Irishman's mishaps in Italy, Poland and Finland. Meeke followed that warning by having a further crash in Germany which meant that he had to settle for another disappointing 12th spot finish. The Tyrone man started Sunday's action only .30 of a second behind Ogier but he lost time to the Frenchman and Finn Latvala in the final five stages. However, the Northern Irishman defended his third place to finish 5.9 seconds ahead of fourth-placed Norwegian Andreas Mikkelsen and he appeared content with his performance after securing his sixth podium finish in a WRC event. "We achieved the first target which was to make it to the finish and be consistent," said the Dungannon man. "I would point out that we led the rally for almost two days. "I think we did a very good job and we couldn't really have expected to do much more on the final leg." The next round of the world championship takes place in Corsica from 1-4 October ahead of the two concluding events of the season, Rally Catalunya and Wales Rally GB.